The goal of the Carbon-Free Nuclear-Free project is to eliminate U.S. greenhouse gas emissions from burning fossil fuels by promoting a zero-CO2 economy in the U.S., and to and to lay out a roadmap to achieve this as soon as is technically and economically practical, without resorting to nuclear power. It will take an integrated and comprehensive solution, as the issues of climate change, nuclear weapons proliferation, and security of oil supplies are intimately connected. 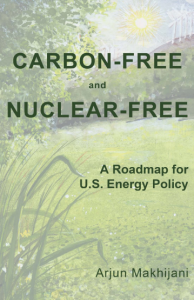 Inspired by the 2007 book Carbon-Free and Nuclear-Free: A Roadmap for U.S. Energy Policy, state-efforts are currently leading the way. See below for additional reports, op-eds, testimony, and more resources related to Carbon-Free Nuclear-Free. More information about Carbon-Free Nuclear-Free including downloadable summaries and presentations. You can download the book as a PDF file (it is a large file, 4.4MB). Download is free, donations are welcome. Renewable Minnesota, March 2012, analyzes the technical and economic feasibility of a 100% renewable energy-based electricity sector for Minnesota. eUtah, a Renewable Energy Roadmap for the state of Utah, with help and support from HEAL Utah. John Blackburn’s 2010 report Matching Utility Loads with Wind and Solar Power in North Carolina: Dealing with Intermittent Electricity Sources. Also see the NC WARN website for more North Carolina resources and information. Energy Efficiency Potential: San Antonio’s Bright Energy Future, October 2008.